We were done and I might have gone straight home to crash, but instead decided to accompany Caroline. A few tweets later and we were set to drop by Drago Centro – especially since it was known that Michael Shearin would be there. Though now set for next week (delayed from a date this week because of filming schedules – ohhh, LA…), Caroline and I wanted to possibly get a peep at drinks that are to debut as the collective Spring Cocktail Menu. It is set to debut next Wednesday, to be exact, and Michael indulged us in a couple of them – without names but with ingredients. Sweet. Caroline did a fantabulous write-up including names she made up for the cocktails themselves – so let’s defer to L.A. Weekly’s Best Drinking Blog of 2009, shall we? Just remember to get the sneak preview for the Spring menu next Wednesday, April 14th all day – all new drinks will be only $6 each. 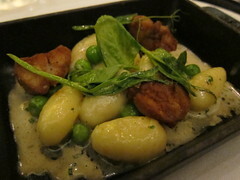 While Michael – by choice or not – accompanied us while we sat at the bar, Chef de Cuisine Ian Gresik greeted us and sent out beautiful mini iron pans of peas, gnocchi and crispy sweetbreads. They were perfectly savory and had just the perfect amount of salt. The gnocchi were tender but had good flavor and great bite. Since this was my third stop this night, I panicked a bit that Chef Gresik would send out more food, but was consoled when Pastry Chef Jashmine Corpuz had also come out to visit us and decided to grace us with her beautiful desserts as our edible night cap. Michael Shearin had us covered with our liquid ones. And out came trays of 3 desserts each – which coincidentally were the first 3 on the dessert menu but couldn’t have covered ourÂ sweets palateÂ more diversely. The light, fruit-adorned one intrigued me in that I had never had grapefruit for dessert, before. 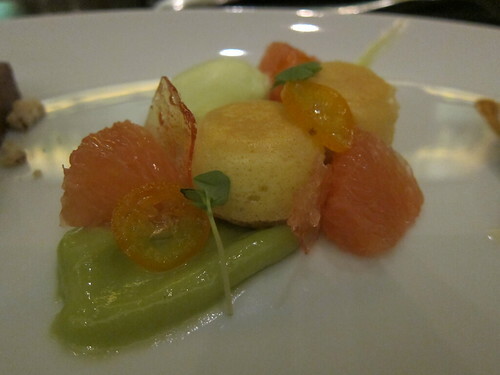 But there the sour fruit was, in all its glory while accompanying tiny biscuits of Extra Virgin Olive Oil Cake, Avocado Mousse and even Basil Gelato. It was aromatic, light and refreshing. The delicious, clear pink chips of Campri candy were the icing on the cake, as Pastry Chef Jashmine had apparently collaborated with Michael to use them as garnishes for both dessert and cocktail – so definitely look for this candy garnish on the new Spring cocktail menu. And oh, the budino! No, this isn’t the famed Osteria Mozza budino – but it’s practically as good and aesthetically elegant, to boot. The chocolate custard was the close-your-eyes heavenly centerpiece and the caramel gelato put the dessert over the top in sinful delight. The pecans gave the dish good weight and crunchy texture while the date carpaccio framed it well. As for the I Bomboloni – it’s the dessert for doughnut lovers, everywhere. 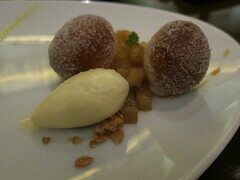 The doughy holes were a perfect, airy texture while the brown butter ice cream was savory-sweet. The tiny chopped-up apples with cinnamon brought me back to my favorite apple pie but the amaretto caramel added a note of sophistication to the dish. Mmm. 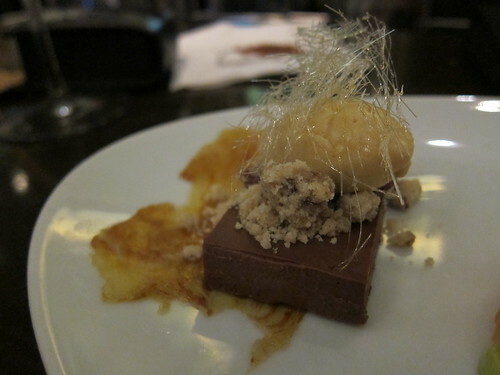 This entry was posted in Downtown LA, Food and tagged dessert, desserts, Downtown LA, Drago Centro, DTLA, Ian Gresik, Jashmine Corpuz, L.A., los angeles, Michael Shearin, pastry, pastry chef. Bookmark the permalink.